Adrenoleukodystrophy (X-ALD) is an X-linked recessive disorder characterized by the accumulation of saturated very long chain fatty acids (VLCFA) in the lysosomes of adrenal cortex and the white matter of central nervous system. Hence, the syndrome combines the characteristics of adrenocortical insufficiency (Addison’s disease) with those of cerebral sclerosis (Schilder’s disease). Skin bronzing, sclerosis of the brain and demyelination are the principal manifestations. The disease was first recognized in 1923 and has been known as Addison-Schilder’s disease. 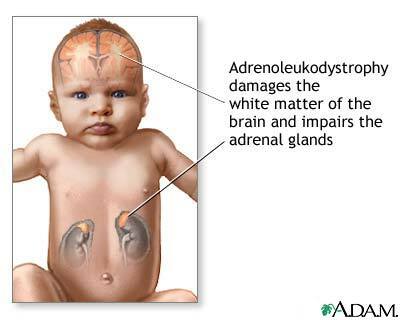 In 1971, Dr. Michael Blaw introduced the name adrenoleukodystrophy: “adreno” refers to the adrenal glands; “leuko” refers to the white matter of the brain, and “dystrophy” means abnormal growth or development. Adrenoleukodystrophy is passed down from parents to their children as an X-linked genetic trait. It therefore affects mostly males, although some women, who are carriers, can have milder forms of the disease. The prevalence is estimated to be between 1:20,000 and 1:50,000, and appears to be approximately the same in all ethnic groups. The minimum frequency of hemizygotes identified in the United States is estimated to be 1:21,000 and that of hemizygotes plus heterozygotes 1:16,800. 1. The childhood cerebral form: this is the most severe X-ALD form and affects only boys in mid-childhood (i.e. at ages 4 - 10). Approximately 35% of patients with X-ALD develop this severe form of the disease. It is noteworthy that there is no relation between this form of X-ALD and the neonatal adrenoleukodystrophy (NALD) that belongs to the disorders of the Zellweger spectrum and is inherited as an autosomal recessive disorder. 2. Adrenomyeloneuropathy (AMN): this is the milder adult-onset form. This form typically begins between ages 21 and 35 and is the most common form of X-ALD. In fact, approximately 40 - 45% of people with X-ALD have AMN. 3. The Addison-only phenotype: this X-ALD form is representative of a primary adreno-cortical insufficiency, without evidence for nervous system involvement. This form occurs in 10% of the X-ALD patients. In female carriers, about 20% will develop a mild to moderate form of X-ALD. Symptoms in women generally do not begin before middle age. Death frequently occurs within 2 to 4 years after symptom onset due to complications such as pneumonia. Cerebral involvement is rare and adrenal function is almost always intact. 1. Boys with symptoms of attention deficit disorder, who in addition show signs of dementia, progressive behavioral disturbance, vision loss, difficulty in understanding spoken language, worsening handwriting, in-coordination, or other neurological disturbances. 2. Young or middle-aged men with progressive gait disorders, leg stiffness or weakness, abnormalities of sphincter control and sexual dysfunction, with or without adrenal insufficiency or cognitive or behavioral deficits. 3. All males with primary adreno-cortical insufficiency, with or without evidence of neurological abnormality. 4. Middle-aged or older women with progressive paraparesis, abnormalities of sphincter control, and sensory disturbances mainly affecting the legs. It may be difficult to establish the diagnosis of X-ALD in a female with a negative family history. Diagnosis is based upon clinical features, most commonly progressive spastic paraparesis, and a panel of laboratory tests. Central Nervous System: affected white matter of the brain is divided histopathologically into three distinct zones: an outermost zone (Schaumburg zone 1), showing active destruction of the myelin sheath and lack of perivascular inflammatory cells; a middle layer zone (Schaumburg zone 2), showing perivascular inflammatory cells and demyelination with preservation of axons; and a central zone (Schaumburg zone 3), showing gliosis and scattered astrocytes with absence of oligodendroglia, axons, myelin, and inflammatory cells. Adrenal glands: the earliest pathologic change in the adrenal glands is the appearance of cytoplasmic striations with lamellae in cortical cells of the fascicular and reticular zones. The lamellae represent precipitation of lipid protein aggregates containing cholesterol esterified with VLCFA. With advancement of disease, the adrenal glands show atrophic change. Testicles: in involved testicles, light microscopy demonstrates hypocellularity and maturation arrest in seminiferous tubules. Ultrastructural examination reveals vacuolation of Sertoli cells endoplasmic reticulum and germ cells. Leydig cells with cytoplasmic striations are detected in some patients, and there may be a reduction in the number of Leydig cells. Ultrastructural lamellae and lamellar-lipid profiles in Leydig cells are pathognomonic findings. Brain MRI is always abnormal in neurologically symptomatic males and often provides the first diagnostic lead. In approximately 85% of affected individuals, MRI shows a characteristic pattern of symmetrical enhanced T-2 signal in the parieto-occipital region with contrast enhancement at the advancing margin. Brain MRI is abnormal in fewer than 10% of individuals who are heterozygous for the ABCD1 gene (see below). The most important laboratory test is the measurement of the concentration of VLCFA in plasma. The VLCFA refer to the lipids with 24 or 26 carbons. Two examples are hexacosonaic acid (26 carbons) and tetracosenoic acid (24 carbons). VLCFA levels are elevated (i.e. more than double than normal) in 99.9% of males with X-ALD/AMN of all ages regardless of the presence or absence of clinical symptoms. •	The ratio of C26:0/C22:0. Table 1 shows the mean results for normal controls, affected males, and carrier females. VLCFA concentrations are determined using electrospray ionization mass spectrometry (ESI-MS). This kind of analysis of VLCFA is extremely specialized and therefore it is performed only in a few laboratories worldwide. An alternative method of VLCFA measurement is represented by the capillary gas chromatography. While the measurement of the concentration of VLCFA is accurate in males, in about 20% of women, who are proven carriers, the test shows normal results and thus gives a “false negative” result. Women should thus be tested genetically when X-ALD is suspected and VLCFA concentrations are normal. Genetic analysis involves the ABCD1 gene which, at the moment, is the only gene associated with X-ALD. The ABCD1 gene spans 21 kb and is composed of 10 exons encoding a 745 amino acid protein. More than 500 different mutations have been identified in the ABCD1 gene (Kemp et al 2001), but most X-ALD kind-reds have a unique mutation. Boehm and colleagues have developed and validated a robust DNA diagnostic test for X-ALD involving non-nested genomic amplification of the X-ALD gene, followed by fluorescent dye-primer sequencing and analysis. The method covers all coding exons and the flanking intron-exon junctions in 10 separate amplicons (Boehm et al., 1999). This protocol provides a highly reliable means of determining carrier status in women at risk for transmitting X-ALD and is applicable to a clinical diagnostic laboratory. On this ground, this method has become the diagnostic sequence-based analysis of choice for many laboratories worldwide. Prenatal testing to determine whether an unborn child is affected is possible if a specific X-ALD mutation has been identified in a family. This testing can be performed at 10–12 weeks gestation by a procedure called chorionic villus sampling (CVS), which involves removing a tiny piece of the placenta and examining the cells. It can also be done by amniocentesis after 14 weeks gestation by removing a small amount of the amniotic fluid surrounding the fetus and analyzing the cells in the fluid. Each of these procedures has a small risk of miscarriage associated with it. Couples interested in these options should have genetic counseling to carefully explore all of the benefits and limitations of these procedures. X-ALD is an inherited metabolic storage disease whereby a defect in a specific protein results in the accumulation of very long-chain fatty acids (VLCFA) in tissues of the body, especially the brain and the adrenal glands. Ultimately the myelin sheath that surrounds the nerves is destroyed causing neurological problems, and the adrenal gland malfunction causes Addison’s disease. While some of the VLCFA that accumulate come from the diet, they are derived mainly from production within the body through elongation of long-chain fatty acids. Thus the accumulation of VLCFA in X-ALD patients results from both an enhanced elongation of long-chain fatty acid and an impaired capacity to degrade these fatty acids. X-ALD is due to mutations or defects in the ABCD1 gene that is located on the X-chromosome (Xq28) and encodes for a protein required for the long-chain fatty acid degradation to take place. It belongs to the ABC transporter. The protein that is missing or defective is called adrenoleukodystrophy protein (ALDP) or ATP-Binding Cassette Transporters. ALDP consists of 745 amino acids and contains a membrane domain with six transmembrane segments in the amino-half and an ATP-binding domain in the carboxy-half of the protein. Figure: Topological model of the Adrenoleukodystrophy Protein (ALDP, black). Amino acids mutated in human X-ALD patients are depicted in red. Immunocytochemical studies demonstrated that ALDP is a peroxisomal membrane protein; this is in agreement with the fact that the breakdown of VLCFA normally takes place in the peroxisome. The peroxisomes are a single membrane-line organelle present in virtually all eukaryotic cells. They are specialized enzyme “factories” that contain in excess of 50 different enzymes involved in a variety of metabolic processes including beta-oxidation (C>22:0), alpha-oxidation of fatty acids, plasmalogen production, bile acid synthesis and glyoxylated detoxification. All mutations other than missense mutations disrupt the stability of ALDP. As a consequence, the ABCD1 gene product, i.e. ALDP, is not detectable by means of immunofluorescence analysis in about 70% of X-ALD affected individuals. For reasons that are not well understood, the gene product may be absent even in individuals who have missense mutations. Figure: Detection of ALDP using immunofluorescence: A) fibroblasts from a control show punctate staining indicating the normal presence of ALDP in peroxisomes; B) fibroblasts from a male patient with X-ALD and a mutation that affects ALDP stability. Note that there is no punctate staining; C) fibroblasts from a carrier with X-ALD from the same family as the male patient. The cells that show punctate staining are those that have an active copy of the normal ABCD1 gene, while those that do not show punctate staining are the cells that have an active ABCD1 gene harboring the mutation. ALDP is crucial for the transport of the VLCFA from the cell into the peroxisome, acting as a gate in the membrane surrounding the peroxisome. However, the exact function of the ALDP protein is unknown. One possibility is that ALDP could import the activated acyl-CoA derivatives (VLCFA-CoA) into peroxisomes where they are shortened through the beta-oxidation pathway. Alternatively, ALDP could import a substrate necessary for the activation and/or stabilization of the VLCFA-CoA synthetase (VLACS), which activates VLCFA into VLCFA-CoA (Aubourg P, et al., 2000; Fourcade S, et al., 2008). The biochemical characterization of the disease is made based on the accumulation of pathognomic amounts of saturated VLCFA in different organs, including the central nervous system, Leydig cells of the testes, and the adrenal cortex. Although the mechanism(s) of disease pathology remains elusive, it is thought that the inability of X-ALD patients to catabolize the VLCFA results in the formation of membrane lipids and lipidated proteins enriched in VLCFAs. These abnormal molecules destabilize the neuronal myelin sheath, thus triggering an inflammatory response leading to demyelination. Moreover, the VLCFA accumulation interferes with the adrenal glands’ conversion of cholesterol into steroids, and prompts deterioration of the myelin covering nerve cells within the white matter of the brain, thus interfering with nerve function. Additionally, fats that are usually made from the breakdown products of VLCFAs cannot be produced. Because these fats would usually be utilized in the synthesis of myelin, nerve function is further compromised. There are neither vascular nor hormonal risk factors. There are no tissue specific risk factors. The childhood form of X-ALD is a progressive disease that leads to a long-term coma (vegetative state) about 2 years after neurological symptoms develop. The child can live in this condition for as long as 10 years until death occurs. The other forms of this disease are milder. A specific treatment for X-ADL is not available, but eating a diet low in VLCFA and taking special oils can lower the blood levels of VLCFA. These oils (a combination of glyceryl trierucate and glyceryl trioleate) are called Lorenzo’s oil, after the son of the family who discovered the treatment. This treatment is being tested for X-ALD, but it does not cure the disease and may not help all patients. - Lorenzo’s oil does not alter the clinical progression of patients with neurological symptoms, but it may have a partial preventive effect in asymptomatic boys whose brain MRI is normal and who normalized their plasma VLCFA using Lorenzo’s oil. - Adrenal steroid replacement therapy (e.g. cortisol) is mandatory for those patients who have adreno-cortical insufficiency (i.e. Addison’s disease), and may be life saving, but it has no effect on neurological symptoms. - Hematopoietic stem cell transplantation (HSCT) has been demonstrated to be successful in arresting disease progression in a small subset of young, pre-symptomatic patients with demonstrable early signs of cerebral demyelination. - Lovastatin was demonstrated to have an effect on VLCFA. This finding, however, could not be reproduced by others. Later experiments showed that statins had no effect on brain and adrenal VLCFA levels in X-ALD mice, and even caused accumulation of VLCFA in these tissues. The drus is still under investigation as X-ALD therapy. •	Gene therapy as a treatment for X-ALD is under investigation.